Mirrors in a variety of styles and types found new homes at the recent Decorative Antiques & Textiles Fair (October 2-7) in Battersea, reinforcing the event as a destination for private buyers and decorators on the hunt for interesting and unusual home furnishings. Among the mirrors sold at the Decorative Antiques & Textiles Fair in Battersea was this Austrian art nouveau cheval mirror by Moser, offered by Thomas Woodham- Smith for £4500. An Austrian art nouveau cheval mirror by Moser, offered by Thomas Woodham- Smith for £4500, was among those snapped up. He added that he had his eye on two mirrors from different dealers’ stands during the fair, both of which sold before he could buy them. 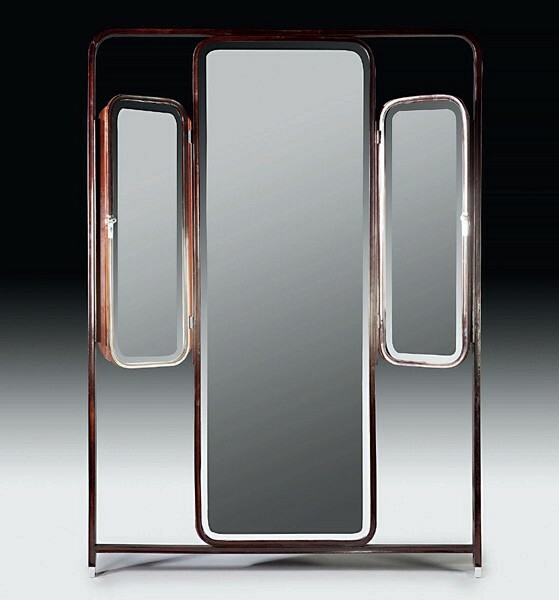 James Worrall, meanwhile, sold two mirrors including an 18th century Swedish carved giltwood example. The other, a French c.1800 type surrounded by a carved giltwood frame in the form of a grapevine, was bought by a client in the process of building a house with a vineyard. “These were not particularly fashionable, they were just exceptionally nice,” Worrall said. Les Trois GarÇons sold a 19th century rococo-style gilded mirror offered for £18,500 as well as a mid-19th century rope-edged mirror ticketed at £5000. A William Hope-style model, ticketed at £1800, went from the stand of John Bird. Following the fair’s busiest-ever opening day, there were steady sales throughout, culminating in the last hour or so when a new Asian customer bought five items of furniture and textile from Kiki Design and Stothert & Trice. Other stand-out sales included a William & Mary walnut cabinet, ticketed at £6800, sold by first-time exhibitor Vagabond, an unusual red lacquer c.1820 japanned side table which Anthony & George Outred offered for £4800 and a c.18th century Mughal floor spread, offered for £16,500 at the stand of Rhona Valentine, which went to a new buyer on opening day. 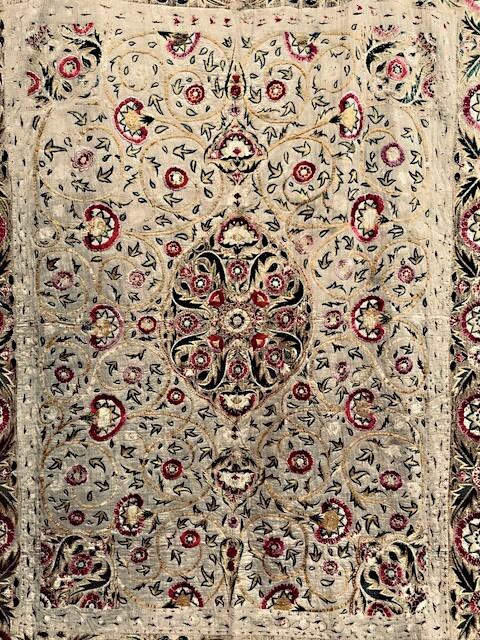 A c.18th century Mughal floor spread that sold at the Decorative Antiques & Textiles Fair in Battersea. It was offered for £16,500 at the stand of Rhona Valentine.